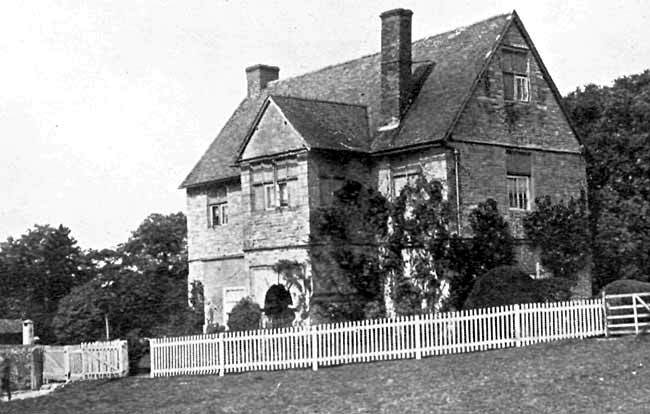 The party then proceeded to South Collingham, and in passing through Langford, had an opportunity of inspecting the Tudor manor house, the property of Lord Middleton. This house, which stands a short distance from the church, and on the opposite side of the lane, is built of lias and faced with Maplebeck sand-stone, but the external effect is somewhat marred by the original stone mullioned windows having been, to a great extent, built up. On reaching South Collingham, the rector, the Rev. G. W. Fosbery, met the party at his church. It is a fine specimen of stonework, standing in a pretty churchyard, where, it may be mentioned, lies buried the Right Reverend Henry Mackenzie, D.D., who, previous to the formation of the diocese of Southwell, became the first Suffragan Bishop of Nottingham. He died on October I5th, 1878. North and South Collingham anciently belonged to the Abbot of Peterborough, who (temp Henry VIII.) had the grant of free warren here, and also claimed the rights and profits of "infangtheof" and "privilege of gallows." These latter were, however, disputed by the Bishop of Lincoln, who had the gallows pulled down. Mr. Blagg read a paper he had kindly prepared, as follows. Mr. T. M. BLAGG'S PAPER. St John the Baptist, South Collingham. This church, dedicated to St. John the Baptist, is chiefly remarkable for the fine northern arcade of Norman work, carried out, I suppose, about the year 1160. The western arch is the most ornate and is of two orders, the inner member decorated with a fine and deeply-cut lozenge moulding, the outer entirely covered with a bold zig-zag, or chevron moulding, enriched with nail-head ornament. The hood mould of this arch is plain, chamfered, and has a quirk on the face. The western capital is cushioned, the eastern bell-shaped, and both have round neck-moulds. The two eastern arches of this arcade are alike and are of two orders, the inner having large roll-moulds at each angle and a V-shaped ridge running up the soffit. The outer members have chevron ornament on the face. The hood moulds are square in section and invected on the lower edge. The capitals are all of cushion pattern, and have round neck moulds, one of which is decorated with a chevron pattern. 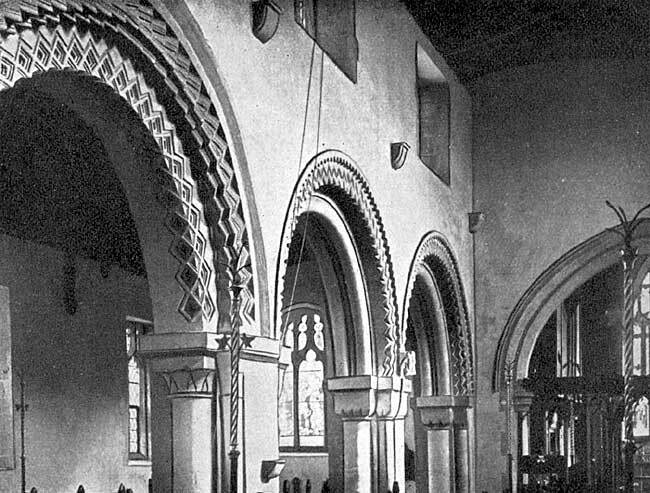 The south arcade of three bays is Early English, about 1250, and consists of clustered columns with plain circular capitals, the responds being ornamented with nail-head enrichment. The piers have water-moulds at the base. The hood moulds of the arches are double-chamfered. The tower arch is Early English of three orders, plain chamfered, the responds consisting each of three detached shafts with bold belt-moulds or zones at half height. The south doorway is also Early English, and a good specimen. There is an Early English font on a column of clustered shafts, with a water-mould at the base. The tower is of three stages, originally only of two. In the second stage the blocked-up Early English windows were uncovered when the plaster was removed a few years ago, and now form an interesting feature. On the eastern face the apex of the abutment of the old steep-pitched Early English roof can be discerned, but the long strips of weather-moulding higher up are modern, put on when the tower was restored, as it was intended to eventually raise the roof to that height. Since then the old ceiling has been removed and the present fine oak roof added, and it seems a pity that the now useless and meaningless moulding should not be cut off, threatening as it does to mislead future students of the church's architecture. The bells, originally three in number, were re-cast into four in 1638, and these in turn have given place to a modern peal of five bells, purchased about 1850. The parish register begins in 1558, and is remarkably rich in Puritan Christian names. Among those occurring are Lion, Sense, Plenty, Repentance, Constant, Discretion, Chastity, Consolation, Constancy, Resolution, Contrition, Humillitie, Lamentation, and Fear-ever, besides many obscure and little-known Biblical names. I know of no other village register of the size so rich in names of this description. 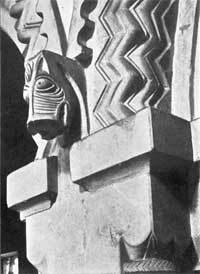 On the south-east buttress of the chancel are traces of three sundials of various designs. The monumental inscriptions in the churchyard, both here and at North Collingham, have been carefully copied by Mrs. Fosbery, a most praiseworthy and invaluable labour, and one which it is desirable that members of this Society should imitate, in regard to any graveyards in which they may have the opportunity of doing so. The preservation and printing of this humbler class of monumental records has hitherto been much neglected, while the information on these fast crumbling memorials is of great importance to the genealogist, ages and other biographical matters not recorded in the burial registers being given on them. On leaving the church, and again passing into the village, the members should notice the old elm tree at the junction of the village streets. It is known as "Stocks Hill Tree," the village stocks having also shared its mound, and though but a fragment of its former self, is noteworthy as having been planted in memory of the Battle of Culloden Moor in 1746. An hour was allowed for luncheon at the Public Hall, after which a start was made for South Scarle, the road thither passing by the old stone-stepped village cross, which stands by the side of the main street of Collingham. This cross is of the Decorated period (14th century), and is of greater size and interest than most of the stumps remaining in the immediate neighbourhood. The shaft is decorated with crockets.